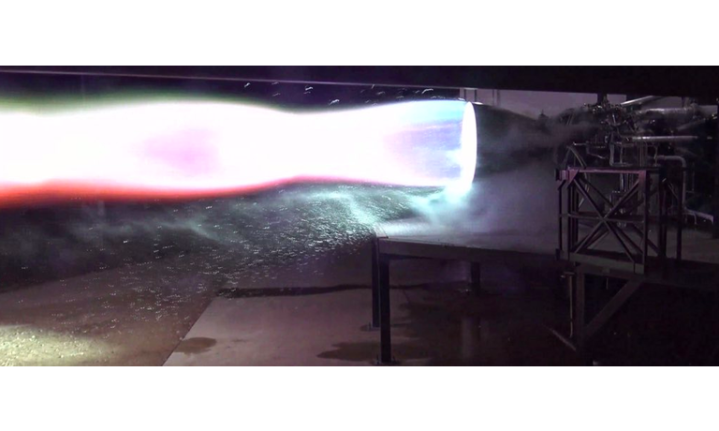 Raptor engines will power the rockets of SpaceX’s future, and company CEO Elon Musk wants the world to know that future is coming soon. He’s posted gorgeous, fiery footage of a test firing of the Raptor engine on Twitter yesterday. In July of last year, he signaled that Raptors would be using metals known as single crystal superalloys in a formulation called SX500. In December 2018, Musk tweeted that the Raptor had been “radically redesigned,” while not elaborating. By January, Musk had done an exclusive interview with Popular Mechanics detailing why the Starship would be made of stainless steel. The Starship (also known as the BFR) will be powered by 31 Raptor engines. Musk claims the SX500 can withstand oxygen-rich gas at pressures of up to 12,000 pounds per square inch, while it gives off an initial thrust of 440,000 pounds-force. SpaceNews points out that that’s less powerful than what Blue Origin is working on at its new factory in Huntsville, Alabama, where the BE-4 engine is expected to produce 550,000 pounds-force. The Starship project, which SpaceX expects to become its main family of spacecraft and carry passengers to Mars, has been going through twists and turns at the company’s Boca Chica, Texas, facility. Among those twists have been high-powered winds, which have knocked the company’s test rocket to the ground and left it in need of weeks of repair. Spaceflight looks cool, but it is not easy.